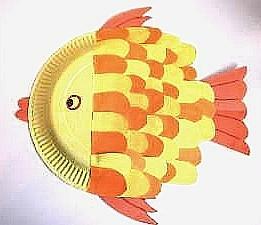 Making a paper plate fish shoal is great way for a class of children to have fun. They look colorful as an aquarium display on the wall, and the various fish patterns give the kids room for their creative imagination. You can make them at home of course, and add them to your collection as you make them. 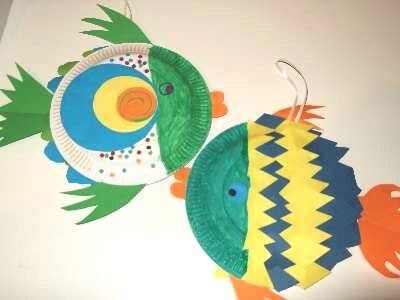 They are easy to make using colorful paper, felt tipped pens and any other material you would like to use for effect. 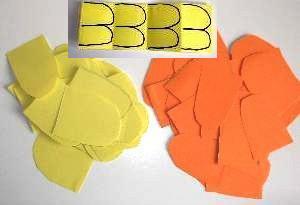 For my goldfish, you will need 2 A4 sheets of paper of contrasting colors, and one A5 sheet (half the size of A4) of either one of these colors or another of your choice. I have used yellow and orange. 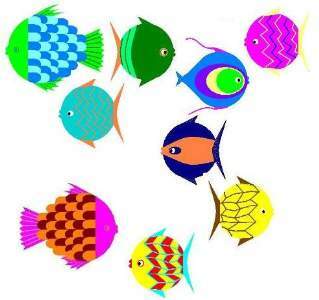 To make other fish for your imaginary aquarium choose different colors. Fold the paper in half along it`s length and do this a second time. Open it up to see if it looks the same as the illustration then re-fold. These are for the fish scales, so do the same to both sheets. 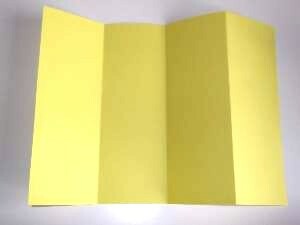 For marking, double fold it again so that you get 4 sections. Draw a large M like the Macdonalds logo in each and cut them out. Now cut those Ms in two to make D or U shapes depending on how you see them. Now you have your scales. 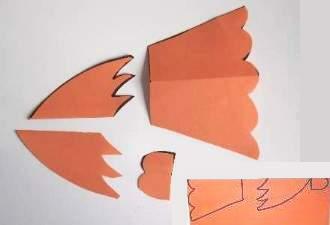 Use the A5 piece of paper for the fins, tail and mouth. You must fold this lengthwise and draw the pieces on the fold. Cut them out. The fins needs to be cut along the fold to make 2. Put all your pieces to the side and get some yellow poster paint or a yellow felt tipped pen. I used the pen. 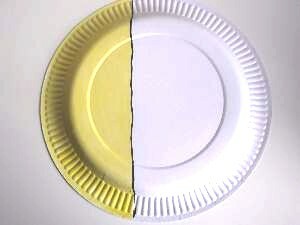 You only need to color a 1/3 of the plate, just like you had dipped it into a bucket of paint. If painting, let it dry before sticking on the fins, tail, mouth, and scales. 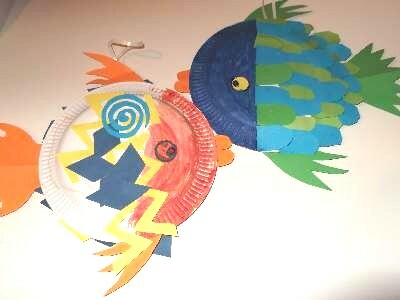 Turn the paper plate fish over and stick a fin at the top and bottom, the tail to the back and the mouth to the front, using PVA glue. You can make it 3D if you like by making 2 sides and gluing them together like I did. Now turn it back and begin sticking the scales on. Start from the back so they go in the right direction. Alternate the colors as you go but if you want to make a stripey fish, make each row the same color. When you have finished draw on the eye, turn it over and stick a piece of string on the back with sticky tape to hang it. 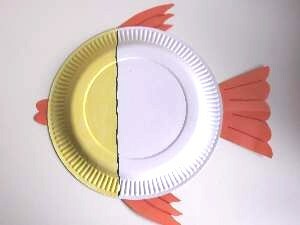 For 3D, make another paper plate fish exactly the same as the first but do not add any fins, tail, or mouth. Glue them together and your done! Here are some colorful variations that you can use for inspiration. They are not all with scales but you can stick colored paper shapes to make up different species. Be creative! Don`t be afraid to be flamboyant! Have fun! 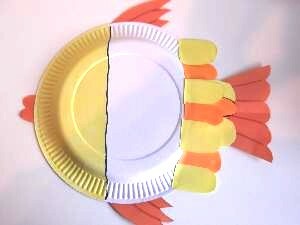 I just love paper plate crafts. If you do to, take a look at other things you can make. Below are the KKC crew`s masterpieces that they did over the weekend. Their fish are reversible! Come over and meet the crew on the main page.